As of version 1.1, it's now possible to blacklist domains. Prevents the domain from ever being added as a direct link, by the affiliate or site administrator (there could be multiple site administrators on a site). Prevents the direct link from working if the direct link was already added and already in use. Domains can be entered with or without a domain protocol (http://, https:// etc) or subdomain (www etc). Adding the base domain to the blacklisted domains will prevent all pages on that site from working. site.com is added to the blacklisted domains list. Any visit from site.com/some-page or site.com.another-page will not track the intended visit since the base domain, site.com, has been blacklisted. If this domain is assigned to an affiliate as a direct link, it would result in that affiliate being tracked for all visits from Google. Any visit to your site from Google could potentially result in a commission for that affiliate. Facebook blocks the full HTTP REFERER from being sent via the browser. This is not an issue with the Direct Link Tracking add-on. The referrer will always be facebook.com, no matter where the visitor came from on the site. This essentially means that an affiliate should never have their Facebook profile URL approved as a direct link. If so, all traffic from Facebook.com to your site, no matter where the visitor came from, would result in that affiliate being tracked. Like Facebook, Instagram does not send the full HTTP REFERER, only their base domain (without any paths). Twitter sends their HTTP REFERER as a shortened domain, such as t.co/13FYBsNCB7/, not twitter.com, or a Twitter profile URL. 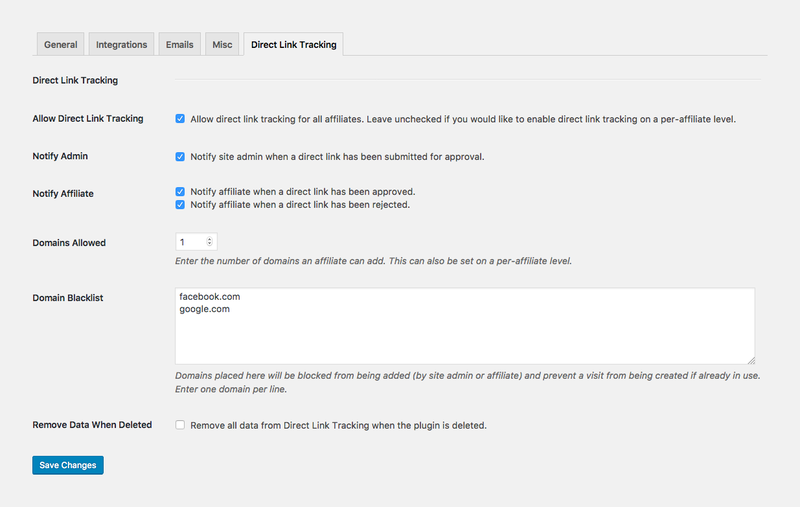 The site that has Direct Link Tracking and AffiliateWP installed is blocked by default and cannot ever be removed. This reason for this is very simple. If an affiliate was assigned your own domain as a direct link, the affiliate would be tracked as soon as a visitor landed on your site, and then moved to another page on your site. This would result in that affiliate receiving commission for essentially every single purchase or conversion.